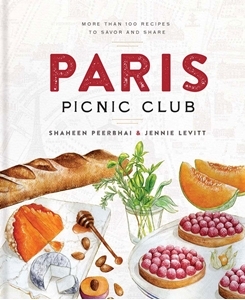 Every Friday for a year in a small town tucked into the hillsides south of Paris, Shaheen Peerbhai and Jennie Levitt made a delicious picnic-style meal for their friends, and it grew into a clandestine pop-up restaurant, serving much-anticipated lunches to eighty hungry guests. Soon they moved their picnic club to parks and hidden spots across Paris. In this charmingly illustrated book, Shaheen and Jennie offer a collection of their flavorful recipes, taking inspiration from the diverse cuisines of Paris. You'll delight in eclectic small plates and sharing platters, abundant tartines, creative drinks, indulgent desserts, and more-to savor and share in your favorite picnic spot or at your dinner table.